ROCHESTER HILLS, Michigan (USA), December 12, 2017 – WABCO Holdings Inc. (NYSE: WBC), a leading global supplier of technologies and services that improve the safety, efficiency and connectivity of commercial vehicles, today announced that R.H. Sheppard, a key supplier of industry-leading steering technologies for commercial vehicles recently acquired by WABCO, received the PACCAR Inc Supplier Performance Management (SPM) Achiever Award. R.H. Sheppard received the honor for the second year in a row. PACCAR Inc, a leading global truck manufacturer, annually recognizes its top performing suppliers in the areas of product development, operations support, and business alignment with the truck maker’s objectives. Through the SPM program, suppliers and PACCAR cross-functional teams collaborate to identify performance enhancements and to develop product innovations. PACCAR selected Sheppard for its reliability and delivery performance. 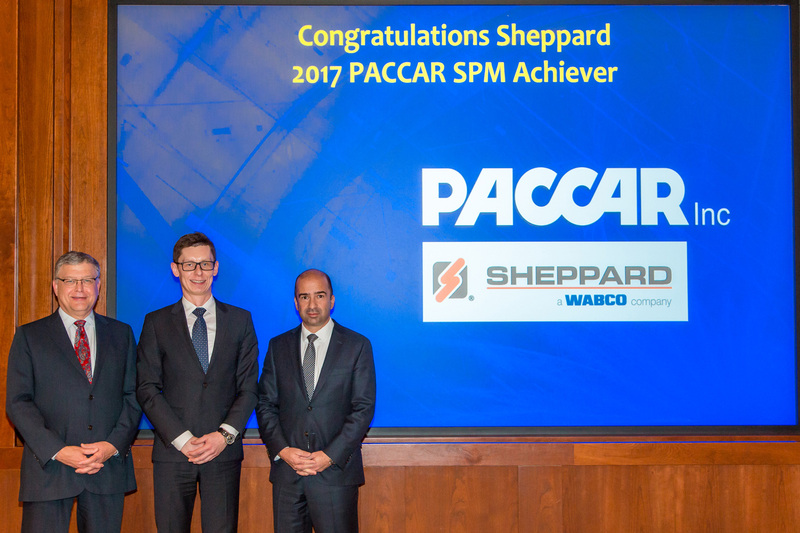 PACCAR has given 89 supplier awards since the launch of the SPM program in 2014. WABCO acquired R.H. Sheppard in September 2017. Sheppard offers a suite of power-steering gears that has set the industry standard for heavy-duty commercial and specialty vehicles. Sheppard employs approximately 900 individuals at its U.S. facilities in Hanover, Pennsylvania, and Wytheville, Virginia. 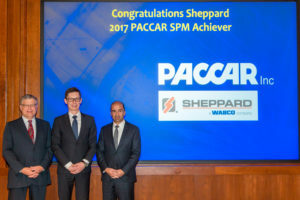 Press photo / caption: Piotr Sroka (middle), WABCO Business Leader of Global Steering, accepted the Supplier Performance Management (SPM) Achiever Award from PACCAR Inc. R.H. Sheppard received the top supplier performance award, established in 2014, for the second year in a row. Pictured here (from left to right) are: Bill Jackson, PACCAR Vice President of Global Purchasing, Piotr Sroka, WABCO Business Leader of Global Steering, and Rogier van de Garde, PACCAR Senior Director of Purchasing.